Leaflet No. 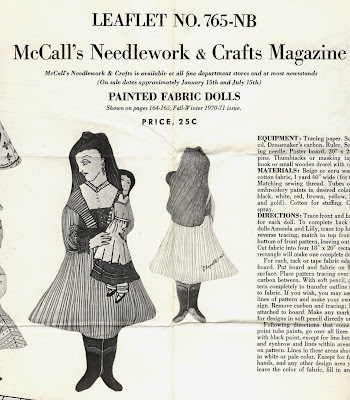 765-NB, published by McCall's Needlework and Crafts Magazine, is a pattern to make three painted cloth dolls. 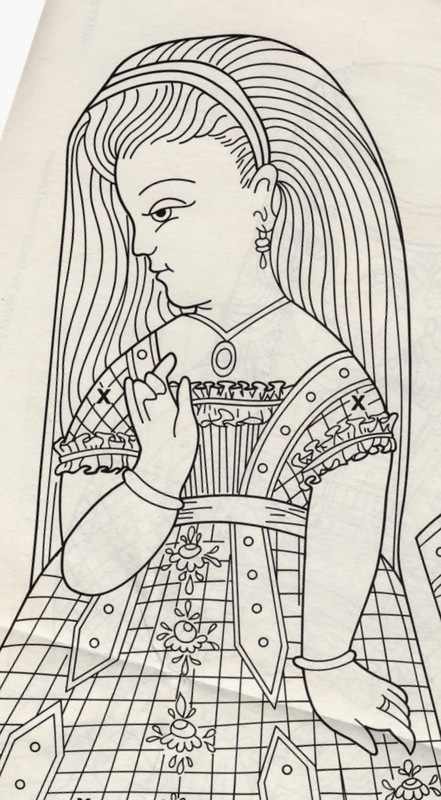 The dolls are simple pancake style, with elaborate designs meant to be made with ball point paint, also known as liquid embroidery. The leaflet is one sheet of 17" x 22" paper, printed on both sides. The three dolls are named Elspeth, Amanda and Lilly. They appear to represent older girls in period costumes. Amanda and Lilly are each holding a doll. They measure about 15" tall. 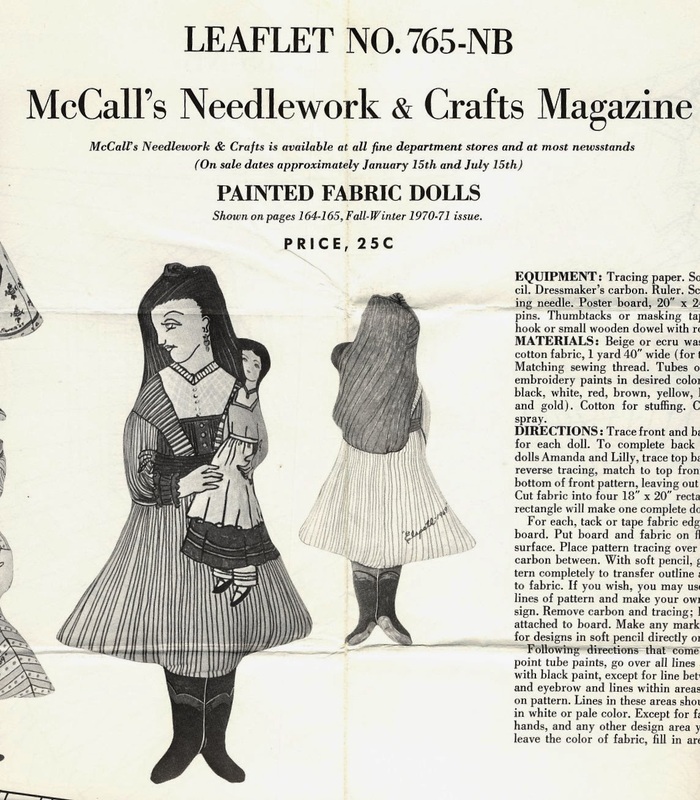 The maker is instructed to transfer the design of the dolls to fabric using tracing paper, pencil and carbon paper. These days it would be much simpler to scan the designs and print them directly on fabric. 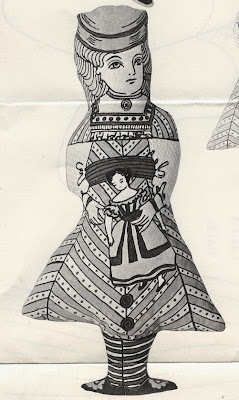 While the ball point paints would give good results, they dolls could also be hand or machine embroidered. The patterns could also be used in an embroidered or appliqued quilt or wall hanging. 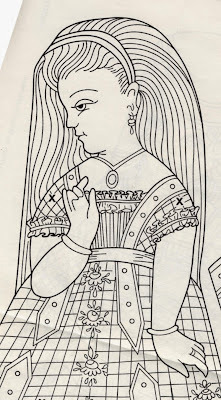 I have never seen a cloth doll made with this technique, have you? After years of looking online, I finally found this pattern. My mother made me "Elspeth" when I was ten. 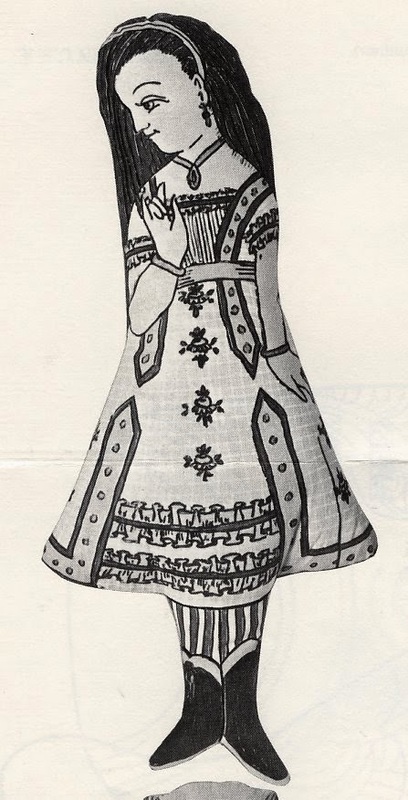 The embroidery paints made a beautiful doll. I plan to make all three. Yes! My mom made all three! However, her embroidery tubes had dried up and she used canvas and oil paints to make them. My older sister got them all and I have been looking and looking for the pattern ever since my mom passed away. Thank you for posting this online! My mom and I designed a new one - an Indian princess. I have the canvas with the drawing we did, but I wanted to make the other 3, as well. Now I can!